Hi there! Today I’m sharing a review for a new post-apocalyptic M/M romance that features shifters of a whole new breed by Megan Erickson. 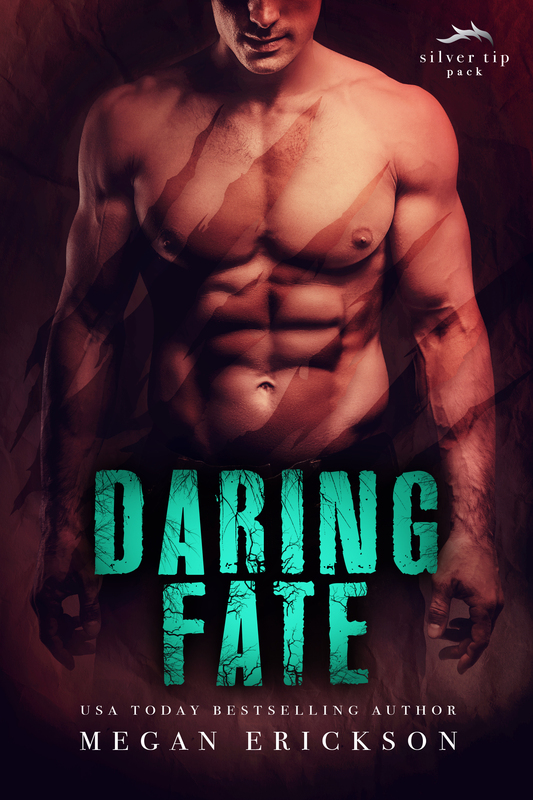 DARING FATE is the first book in a series that is whoa, SMOKING hot, and totally awesome. This story is set in the future, long after the death of humanity. There are three types of people who still walk the Earth: shifter, Were and Nowere. Shifters can vary between human and wolf form, while Weres can be human, wolf or Were, a cross of the two (the mental image I got was of Lycans from Underworld). Weres are enormous, easily six and a half to seven feet tall. Weres and shifters had lived alongside humans, but an active virus outbreak killed most of the humans. When it got into the Were population, the Weres didn’t die, they became undead killing machines known as Nowere. Packs of Nowere roam the land killing whatever they come across. Shifters live in packs, as do Weres, though these populations rarely mix. Ten years ago Reese’s family’s Whitethroat shifter pack was decimated by Nowere attack. His family fled to Xan’s Bluefoot pack to seek shelter. It wasn’t a good call. Ten years of servitude for Reese, while also defending his younger sister, Selene, and brother, Jude, from Xan’s brutality is at it’s end. His plan to get them out of the compound goes bad, however, and Reese is beaten almost dead and left out in the wild for Nowere to ravage. Jude’s desperation to save his brother is so great he turns to the nearby Silver Tip Were pack for sanctuary. When Reese becomes conscious, he’s not only scared out of his mind–all the stories he’s heard of Weres are even more brutal than Xan’s pack–he’s dejected that Selene was left behind for Xan to take. Meeting the Were Alpha, Dare, is the most confusing experience of Reese’s life–because he recognizes instantly that Dare, all seven feet of bulging muscle of him, is his True Mate. The sexytimes? O.M.G. Off the freaking charts. The first half of the book is pretty much a treatise on how to build a bond by never getting out of bed. And, yet, I was never tempted to skim. There’s a knock-out punch of emotion in there. Dare and Reese are compelled to each other, and their responses are dramatic. Their insecurity is interesting, and Reese is extra conflicted because he needs to escape Dare, somehow, so he can rescue Selene. Meanwhile, his, and Jude’s, welfare is dependent upon Dare’s good graces, and position as Alpha. There are dissenters, chief among them Dare’s cousin, and they aren’t impressed with their Alpha mating a wolf. Reese knows that showing any fear, or desire to leave, in front of the pack could lead to a power shift. There are a number of complicating factors that are organic to this world, and I really dug the intricacies of the new society. While the whole first half is about Dare and Reese’s bonding, the second half is the hunt and rescue of Selene. It’s a wedge between the newly bonded mates, and quite harrowing. The world here is stark, and yet rich–within the Silver Tip pack walls, that is. These Weres are awesome, and their pack is a peaceful community, most of the time. The Nowere are horrifying, and the stakes are extreme. Just when I thought they were going to be okay? Bam! Another problem.COuldn’t turn the pages fast enough. The stage is set for another story, but this one is wrapped up tight. Expect love, lust, lore, and luck to win the day. I can’t wait to dive back into this world. Interested? You can find DARING FATE on Goodreads, Amazon, Barnes & Noble, iBooks, and Kobo.